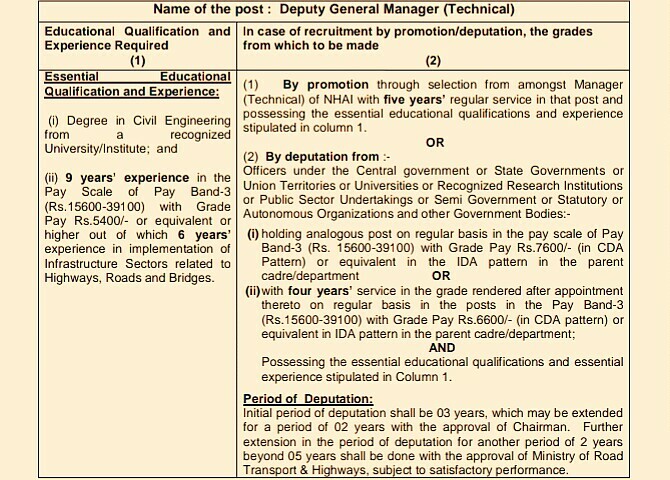 The National Highway Authority Of India, Is Appointing Eligible People To The Post Of Deputy General Manager & Manager (Technical), In Promotion/Deputation Recruitment Process. So Interested People Can Apply For This Job Through Offline Application Mode, Within The Given Time Period, Which Is Mentioned Below. Deputy General Manager (Technical) →117 Vacancies. Total Number Of Vacancies →141 Vacancies, Kindly Do Go Through The Image's Below For Educational Qualifications And Experience Requirements. B. 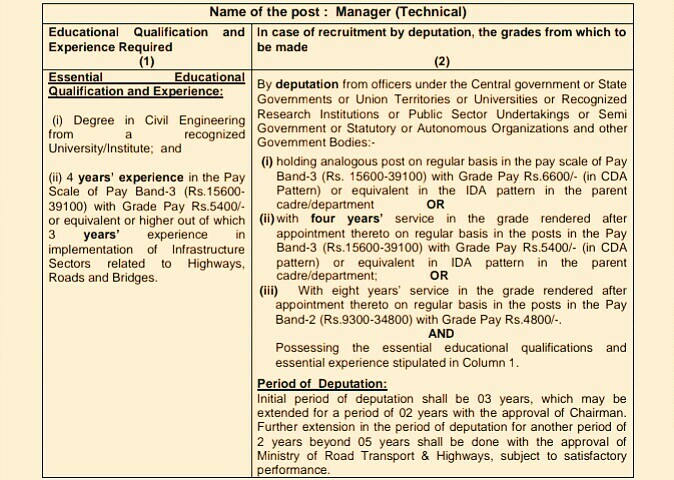 Eligible Criteria For NHAI Deputy General Manager/Manager (Technical) Recruitment Notification 2019. Age Limit →Should Not Exceed The Age Of 56-year-old. Mode Of Examination/Selection Process →NHAI Selection Rules Applies. How To Apply/Last Date For Offline Application Form Submission →Candidates Have To Submit Their Properly Filled Application Form To This On Or Before- 8th Of May,2019, To GM (HR&Admn. )-I Plot No: G – 5&6, Sector – 10 Dwarka, New Delhi – 110075. For More Info →The Official Website NHAI . Click Here To Download Both Official Advertisement & Application Form NHAI Recruitment 2019.